GRATTIS sassy63!! GOOD ONYA Kipper1258! For the second year, this third and final race of the 2018 SSANZ Triple Series – the Baltic 50 – found us circumnavigating Waiheke island, the former home of the late and still missed SOLer NZL_Yachtyakka. 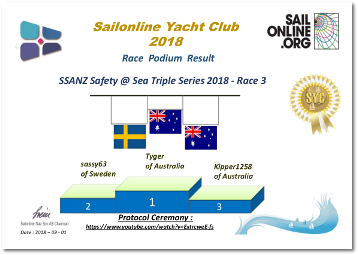 As has happened with the other two SSANZ Triple races this year, there was great enthusiasm among the small fleet participating, but, sadly, the need for most Europeans to find their bunks, meant that several boats found themselves bbq-ing or otherwise not steering in a useful direction! The Hauraki Gulf has a wealth of islands on which to bbq but it is always surprising how many SOLers find themselves heading off across the Pacific! Our podium three, two from Australia and one from Sweden, are to be congratulated on their super-narrow success. With just 16 seconds separating first from second, and 53 seconds separating second from third, this was a fine victory for them. Congratulations, guys!